The project was the replacement warm roof to our existing conservatory. A first class job was produced by enthusiastic and professional craftsmen. 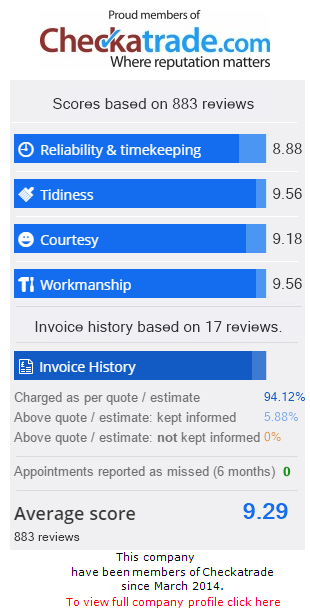 Timekeeping was excellent and I would have no hesitation in recommending this company. I recently had a new conservatory glass roof built by Abbey Windows to replace an old polycarbide one and I was really pleased with the quality, service and cost. The price we received from them was very competitive and the whole process from start to finish was excellent. The survey was carried out within 1 week of initial deposit payment and each stage clearly explained and what extras were available with no pressure selling at any stage. The work was undertaken in a very professional manner by the team and the electrical work was well co-ordinated so that there were no delays. The guys worked hard to complete most of the work in a day and half leaving no mess at all. You would not have known they had been here apart from the new roof. Finally and most important of all we are pleased with the new glass roof and the gable end design. It has opened up our conservatory which now looks much more spacious and modern. Great result. Many thanks Abbey Windows. We recently had our new front door fitted by Abbey Windows and also purchased some windows on a supply only basis. To start with their customer service is excellent - I felt that nothing was too much trouble, and they were happy to alter the quotes until we were 100% happy with the product. It was easy to order and some of the windows were even ready earlier than expected, which was great. They also offered to deliver the windows for us for free, a huge bonus as we are not just around the corner. When the door was fitted they came on time, the fitter was excellent and has done a lovely job. We absolutely love the new door and it really finishes off our new porch extension nicely. We have had so many neighbours and even random people walking past complement us on how lovely the door looks. I wish we had known about Abbey windows when we replaced the other windows in our home, their windows are so much better quality than the ones we bought before. We will definitely be back to order more windows from them in the future and would not hesitate to recommend the company to anyone who wants quality products for a very reasonable price, and excellent customer service. Lovely local company! Thanks. The staff are friendly and knowledgeable at Abbey. We’ve experienced seamless service throughout and the front door is great quality - really important for us as Abbey replaced a competitors door (that we had fitted only 6 months prior). Installers were punctual, curteous, tidy and their attention to detail was impressive (other half is a tradesman with a high attention to detail and even he was impressed!) We are so happy that we have just booked for Abbey to do our glazing for our extension. ABBEY WINDOWS COME HIGHLY RECOMMENDED!!! Great service, great windows. Well our windows and door replacements are done, and it went very well indeed. They team were very careful and tidied up as they went. The windows are so much better than the old units, and despite the cold weather we have had no condensation on the inside at all. Very happy with the service from Abbey Windows. The sales team were helpful not pushy and the quality of the windows and the door are great. The fitters were fast and cleared up immaculately. Would be happy to recommend. We had some UPVC Bi-Fold doors fitted. They look amazing, the whole company were lovely to work with and kept me informed. Trusted Trader indeed! Thank you. Brilliant job. Very good service quick, left no mess, highly recommended. Prompt/clean/professional. Arrived on time. Very clean workers. Tidied up after job completed. Great job from Phil/Toby and Andy. Repeat customer for Abbey. As per last time all work completed within the time guidelines, to high standard and with just the minimum contact as required. They will be first on my list for any future projects. Brilliant job. Excellent service from purchase to installation which was carried out in a prompt and professional manner. Prompt and professional. The replacement unit was installed very efficiently without any mess. Good job done in no time at all. Very happy from start to finish and an easy process. We found all staff friendly, helpful and with no heavy sell. Installation team excellent and nice people to have at the house. We also found it good to be able to see and discuss the products in your showroom before making a decision. Would definitely use again and recommend. Excellent service and competitive pricing. Excellent service from initial contact through to completion of installation. Brilliant, as usual. Arrived promptly, Clean and tidy worker. Answered all queries. This is the second job done by Abbey. They were great both times. Thanks guys! Excellent service from meeting Rob in the showroom to having the doors fitted by Chris and his colleague. Rob listened to what we wanted and offered options based on what we said rather then selling to us. Chris and his colleague where very happy whilst working and did an excellent job. Friendly, professional and excellent results at a great price. Will always recommend Abbey Windows and use their services again. Right from our initial meeting with Neil Humphries our experience in dealing with Abbey Windows has been first class. Neil gave us some great ideas which enhanced the conservatory design beyond our expectations. Neil then passed us over to the installation team where each stage of the build was overseen by Elaine who kept us up to date throughout. Every trade person who came to our house during the process was extremely professional, punctual and discreet. I would have no hesitation in recommending them. Replaced my 25 year old Edwardian Pshape conservatory with a more modern design and top of the range Ecoclean Blue Sunshield roof but on the exact floor space, thus saving on new foundations etc. The whole process from design, quotation , build and snagging went to plan and I always felt like a valued customer. Drawings, specifications, pricing and expectations were emailed at every step so there were no surprises or misunderstandings for either side. Named individuals allocated for each step with one person as a prime contact for the whole process. Well done. Absolutely love my new windows and doors professional service from quote through to fitting lovely company to do business with. - could not find fault. Chris Coxhead gave me designs/concepts I’d not even contemplated and they are brilliant. Graham Gibbons happy to change any window designs before fitting. The 2 teams of fitters arrived 10mins early refitted the whole house within 5hours and hardly stopped for any breaks - even though I made them coffees throughout. They even cleaned up inside and out so you’d not even know they’d been. They explained everything from maintenance serviceability, went around with me testing every window and door making any adjustments there and then re-tested to ensure I was happy with everything before they left - I have to say this was definitely a 5 star rating! Thank you. The customer is most definitely the focus of the staff at Abbey, brilliant job well done. Special thanks to Danni your a star for looking after us. Really happy with our new back door, the cost to supply and fit was pretty reasonable and the showroom is open on Sundays which was really helpful. I have used this company on three occasions and the work is of an excellent standard. The staff are very friendly and professional. I would highly recommend this company. Pleasant company to deal with , everyone i spoke to friendly and helpful. The fitting of 1 x window was done in quick time to a high standard to match the existing house windows. Communication was also very good and they are easy to get hold of to ask questions. Wouldn't hesitate in recommending. Friendly, professional and excellent results at a great price. Will always recommend Abbey Windows and use their services again. I highly recommend Abbey Windows for there fast, friendly and reliable service. Fantastic quality craftsmanship and great value. If you want peace of mind, I would give Abbey Windows a call! We have worked closely with Andy from Abbey Windows over the years on many different events for varying charities and his support and enthausism is second to none. These charities really have benefited from his dedication. I have also used Abbey Windows on a personal level and have found their service, install and after care support absolutely fantastic. No need to look any further than these guys! Having worked with Abbey window since nearly the beginning They never fail to impress me with the quality of product , craftsmanship, professionalism and general efficiency that runs through the whole company. We use Abbey windows often and when we do they offer us peace of mind knowing that when they are instructed the job will be done well and on time and with a great aftercare. We have visited the showroom on two occasions, once without booking an appointment. Both visits were positive experiences and the front room staff were both welcoming and knowledgeable. Anna, in particular was extremely helpful and offered me a chair without waiting for me to ask. On our 2nd visit Andrew helped us through the complexity of the ordering process and he proved to be a mine of information. Abbey sell good products and give an excellent service. They also have a good showroom. Excellent product, service and installation. Totally professional and efficient at all stages of the work. Great company to deal with, professional at all times - thank you! Great service, all done on time with very little mess. Very hard working team, and a great price as well Thank you Abbey! Great Company, staff are excellent very professional, with great customer service. I would highly recommend Abbey Windows. Had new doors and windows - great service. Arrived when they said they would and very happy with the products supplied. Am so pleased with my new windows and door. Having had problems with double glazing companies in the past I have no hesitation in recommending Abbey to everyone. They are friendly, reasonably priced and efficient. I particularly like their attitude to no pressure sales. Abbey Windows are a really great company to work with. Very professional and friendly. I would recommend! I would highly recommend Abbey Windows. They have such a great range of quality products coupled with outstanding customer service that is second to none. I would highly recommend. I was so impressed with the fitters, Toby and Phil who did our windows a couple of days ago. Not only did they do a lovely job and make sure I was completely satisfied, they also had a nicely professional and courteous way of being with each other. I have had my family use Abbey Windows over the years and I am more than happy to recommend them to anyone. The staff are always helpful, excellent customer service. Very efficient! Fantastic team at Abbey Windows, very helpful staff and great products! This is the second time I have used Abbey Windows products. The service and the products were excellent. I will definitely use Abbey Windows for any future products. First class service and top quality installer providing excellent products. Highly recommend this Company. Received a great service from Abbey Windows. Would highly recommend. Excellent service from start to finish, 100% professional and great value for money. Wouldn't hesitate to recommend. We have been really impressed with the abbey windows team and would definitely recommend them! Polite, conscientious and friendly staff from the office team to the fitters! Highly recommend! Was a little sceptical at first as it's a smaller company and their quote was unbeatable but will definitely call on them again to do further work. They did a fantastic job of our front and patio doors, everything finished to perfection. They were professional, tidy and polite too. I would highly recommend Abbey windows. Friendly service from the office and from the team who fitted my front window. Quick and easy job with no fuss. Great prices too. Thank you Abbey Windows. Abbey Windows replaced all my windows and doors. They look amazing! Staff are so friendly and reliable. So happy! Thank you! 5* service from start to finish. The team from Abbey were friendly, professional. Great communication and the front door is outstanding quality. We will certainly be using Abbey Windows again! We had our current windows installed by Abbey nearly 20 years ago and have never had any issues. So when it came to getting our patio door replaced (following an accident) with some French windows plus some soffits work, we went straight back to Abbey who were not only competitive but very friendly, constructive and professional in their approach. We are delighted with the work they have done....and are now actively considering the next refurbishment with them. If you want it done to a high standard at a fair price, from a reliable / dependable company who you know will be around to honour any guarantee....then you don't need to look further, in our view! Abbey Windows recently fitted all of our doors and windows for house, extension and garden room. There were 2 phases to this project. A team of 4 completed the 1st phase in 1 Day it was amazing watching the them at work. We were super impressed by the speed, efficiency, and professionalism of the whole team. Not only did we have everything put back exactly as it was the windows looked so good it was though there was no glass a total inside, outside experience. Phase 2 was just as good Craig and Callum from the Reading branch excelled by completing the extension and garden room ie fitting 1 bifold, 3 windows, and 2 French doors over 2 days. Their work is exceptional apart from achieving a brilliant finish they were punctual, respectful, polite and they worked almost nonstop throughout the entire project. A very special thank you to Craig great co-ordination and hard work and to the rest of the team. We now have fabulous aluminium frames and great double glazed windows and doors. WELL DONE ABBEY WINDOWS. Abbey Windows just fitted our new front door and it looks amazing. Quality product, excellent and friendly service. Thanks so much. Would recommend you (and will do!) to family and friends. We can not recommend Abbey Windows strongly enough. Wonderfully professional, experienced and friendly from start to finish. Very helpful every step of the way, ensuring the right product for you. Extremely happy with our installation of windows, front door, back door & patio windows. Thank You All at Abbey for transforming our house. Go Abbey, truly epic! THANK YOU.... THANK YOU.... THANK YOU...... I am one happy customer!!! After suffering from a whistling window for nearly a year and having my sleep disrupted every time the wind blew.... Abbey Windows fitted a bedroom window for me and solved the issue. I had originally had a new bedroom window from a different local Bracknell Window company a year and a half ago and a couple of months after installation the window started to make a noise when it was windy. Needless to say the other company did not resolve the issue after contacting them several times and have lost my business now. Abbey Windows’ service has been polite and efficient and they managed to fit my new window quicker than quoted.... much to my delight. They didn’t leave any mess and explained how the fixtures and fittings worked. Very thorough indeed. I have waited a couple of weeks before writing a review as I wanted to be sure my whistling window noise has gone.... and it has... whoop whoop! I would definitely use Abbey Windows again and wouldn’t hesitate to recommend them. Abbey Windows came and replaced all windows and doors on my house and the annex attached - all members of staff were so friendly, overall a great company to deal with. Would recommend to anyone! Just had a new front door fitted and couldn't be more delighted with the results. Good strong solid door. The gentleman who fitted it arrived bang on time. Worked cleanly and efficiently. Made sure it was all neat and tidy before he left and that we were completely happy with it. Would 100% recommend them and would use Abbey Windows for other jobs I need doing. Thank You it has changed the whole look of the house. Wished we had it done earlier. The service we received was very good from beginning to end. The process was clear and straightforward from the point of order through to installation. We are delighted with our new windows and doors and we would recommend Abbey Windows to other people. I have nothing but positive comments about this company. They were the first and only company we contacted for the work. The reason I know they gave us a good price was because we had other windows fitted by a well known company that charged us a ridiculous amount and we weren't even happy with the work! There was no pressure sales and I just felt comfortable with the whole process. Highly recommend. Abbey windows installed a new front door for my 82 year old mother. The service we received was exceptional. Neil the salesman was very knowledgeable and there was no hard sell as there is with other providers. Every time they came to the property they phoned me before hand so I did not have to take a large part of the day off, this is priceless if you work. They were always on time, the installation was excellent and they went out of their way as we had to make a couple of adjustments to the door due to my mums arthritis. I really felt that they cared about me and my mum as customers. They take the view that this is a long term relationship and you really do feel in safe hands. I am now getting my door done by them as I was so impressed. Really pleased with the service. We requested a quote for 1 window to be replaced. Abbey Windows were very competitive in price, seemed genuinely interested in taking care of their customers and did not try to convince us to get other windows done at the same time, unlike some of the bigger companies who visited us.The window itself is great - good quality and well-fitted. Everyone we had contact with in the company was helpful, polite and professional. No complaints at all. Thoroughly recommended. Thanks for doing a great job. Just a quick note to say how pleased we are with the new windows and how the installation went yesterday. The two Chris's and Liam were excellent. They worked really hard, were courteous, professional and did the job with as little fuss and mess as possible. Having had our windows installed by Abbey, they were first choice for our conservatory. We revised the design several times, but Abbey patiently kept up with us and helped us to improve the design until it was perfect. They arrived on time for the fitting and finished on time as well. The result is excellent quality and just what we wanted. Well done! "We chose Abbey Windows for our new windows and doors - we're very glad we used Abbey." "New composite front door fitted - work was completed quickly and efficiently, and the fitter was polite and friendly. Cleaned up very well afterwards." "The installer was very careful in fitting all the units in my Edwardian home and took endless care to make sure the modern replacement was expertly and superbly fitted without damage to the main porch structure." "The fitters Gavin and Liam both carried out a good install. Good workmanship, tidy and courteous. Highly recommend them." "Abbey Windows fitted my new windows and doors. They have provided a fantastic and excellent job in fitting the new doors and windows, plus they explained everything in complete detail." We chose Abbey Windows for the removal and fitting of 10 double glazed windows and one door. They were exceptionally friendly and offered excellent service from ordering in the showroom to fitting. All staff were very professional and polite throughout the entire process. "Excellent company right from the start of the process. Each person we came in contact with from Abbey Windows, from the sales people to the surveyors to the fitters were brilliant. Always courteous and flexible to changes in plans and ideas. The fitters went beyond their remit by fixing a door that wasn't being replaced that they didn't need to. Very pleased, they really went above and beyond." New back door - very good, extremely pleased with the result. Abbey Windows removed my old bi-fold doors and replaced them with new ones - I'm extremely pleased with the finished result. "Fab local business with incredible community values and spirit." "A very caring community business!" "I would really recommend Abbey - they replaced all the windows and doors in my house and did a fantastic job. Great people and a great service, very professional and helpful." "Very happy with the installation, no hard sale and a pleasure to deal with!" "Very pleased with all contact level of company helpful/friendly and professional!" "A 'no hassle' service, good price, installation on time and quality work!" "The main installer was of the highest quality and in our opinion worked really well on his own. First rate workman and a credit to your company!" "We would have no hesitation in recommending your fitters and yourselves, Abbey Windows, to anyone else in the future"
"We would like to say that we were very impressed by the product and service you supplied, especially impressed by the installation completed by your installer." "Straight forward Sales and efficient clean installation. Well Done!" "We are absolutely delighted with the service, quality and outcome"
"Very pleased by prompt, clean and tidy installation." "I was very pleased with the excellent result your installer and his assistant carried out despite the foul weather conditions they worked in. What great ambassadors for Abbey Windows." "Very happy with the service and product, insulation team were a pleasure to have around." "Comparing prices with other companies I found you gave a very good price for good quality windows and workmanship"
"We were particularly pleased with the quality of the installation work, the need for any making good was minimal." "The following day after installation I noticed one door was not closing properly, I contacted your company and an appointment was made for 3 pm the same day. A member of staff arrived on time and rectified the fault within minutes." "I was very happy with the no pressure service I received." "Your installer did a wonderful job. He took great care and attention to detail. He was very polite and tidied up afterwards. He is a credit to your company and I hope to use him again on my next phase of windows maybe sometime next year." "This is the second time we have used Abbey and once again have been completely satisfied with the service you have provided." "It is really appreciated that you quote one price, and not use the selling techniques of many national companies. Thanks." "Cannot fault the installation, exactly on time, minimal mess and considerate installers." "Very clean, efficient and pleasant fitters. The whole business and installation was conducted without a hitch." "It is really appreciated that you quote one price and not use the selling techniques of many National companies. Thanks." "We were very pleased with our new front door and the service right throughout and from the beginning was excellent. Thank you." I particularly appreciated knowledgeable staff and helpful booklets. "We were extremely impressed by both the cleanliness and tidiness of the installers. Overall an extremely satisfactory job. Many thanks." "The patio door runs freely and quietly, not like the old one. We were very impressed with your service and all your staff, from the Salesman onwards were friendly and efficient." "Many thanks for a great job at our shop. Our tenant was really impressed with the team and professionalism. We will certainly recommend you to our friends." "Excellent quality and service. I have no hesitation in recommending Abbey." "Everything was perfect. The men cleared up after themselves and were very polite. An excellent service." "Excellent Service & quality. Thank you very much." "Difficult to improve on the attention to detail of your fitters and the diligence shown in leaving the site clean and tidy." "Very happy with the installation and with the professional and diligent manner of the fitters. Nothing too much trouble." "The salesperson did not keep phoning ‘his boss’ for price reductions – one fixed price given suited us – no fuss or fibs!" "We found the fitters to be excellent workers who took a real pride in their work. It was a real pleasure to work with them." "Bob and your installation team do you proud. Your two installers were two if the nicest and most professional workmen I have ever had work done by." We were very pleased with the quality of products and service we received. "Abbey windows. No hard sell, competitive and I love my new windows and door. Had it done about 3 weeks ago and my sister is getting hers done in the next few weeks." "We were happy with all aspects of Abbey’s service. Keep up the good work." Fantastic local company, that cares and invests in staff & community.